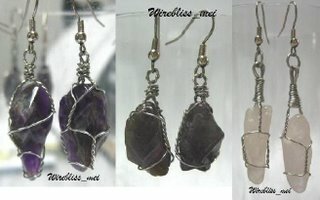 Still with wire wrapped gemstones. 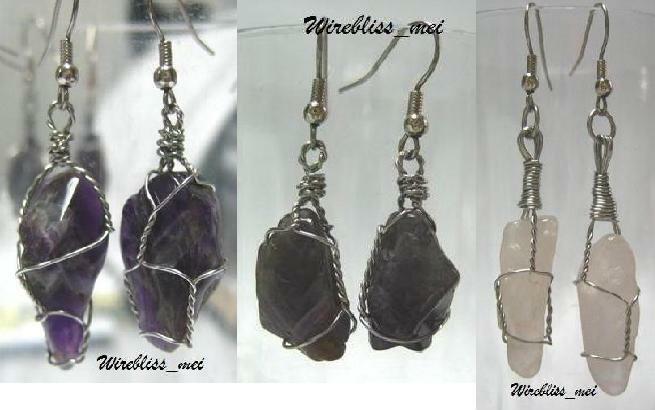 Here are the wire wrapped pendants and earring sets that I made from the gemstones my friend handed over to me. Still rose quartz & amethyst. Guess the sister really likes these stones; after all rose quartz is believed to enhance all forms of love: self-love, mother love, caring, kindness, platonic and romantic love. People also believes that it opens our hearts and encourages us to be tender, peaceful and gentle as well as nurturance and helps us attract positive, gentle love into our lives. Amethyst on the other hand is associated with increased nobility, spiritual awareness, meditation, balance, psychic abilities, inner peace, healing and positive transformation. This stone brings an understanding of death and rebirth and relieves stress. Amethyst is a teacher of all things spiritual, mystic and psychic. This stone is very healing of body, mind and soul. I must admit that I am not very good at wire wrapping stones yet but it’s good practice. The wire weaving for the bail was an idea from somebody’s website – can't remember the site now.